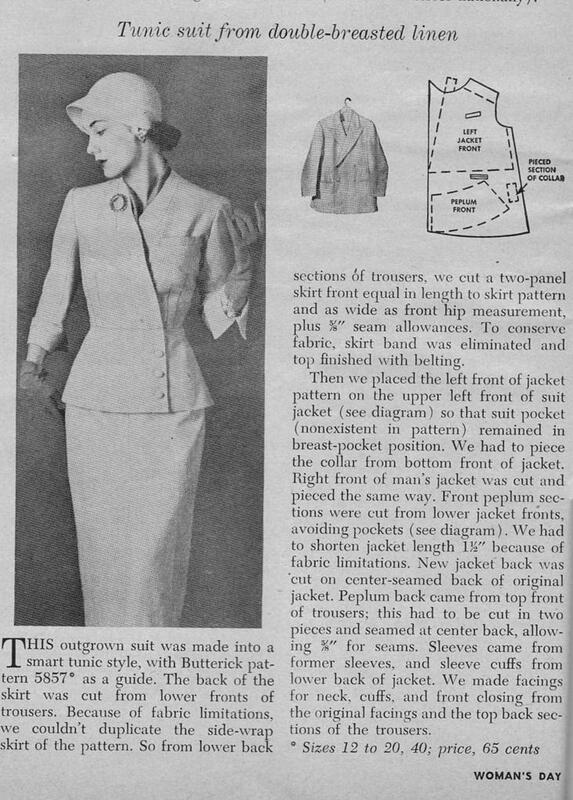 The Woman's Day magazine from 1951 that I purchased a couple weeks ago is so full of interesting articles and ads. 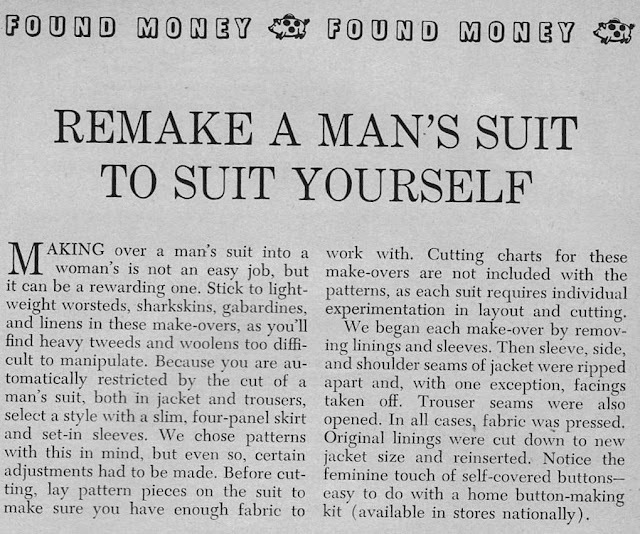 This one is in the "Found Money" section, and instructs the housewives of the 1950's how to make a woman's suit out of a man's suit. The suits are really quite stylish. 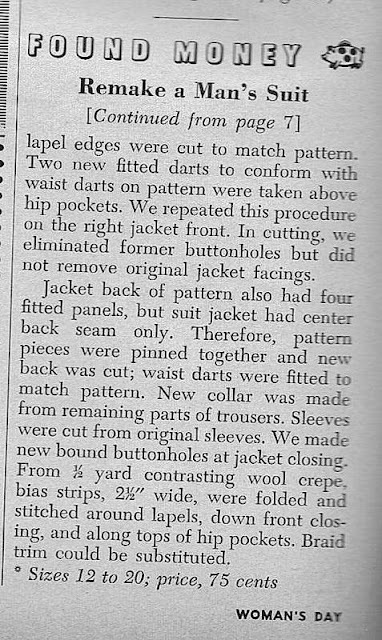 Did you notice that the patterns are for sizes 12 to 20? These gals look smaller than a size 12. Pretty small waists. Did they know how to recycle or what? and the sizes tell me that people weren't afraid to eat back in the day lol - Marilyn Monroe had a tiny waist too and was a 14 or 16! 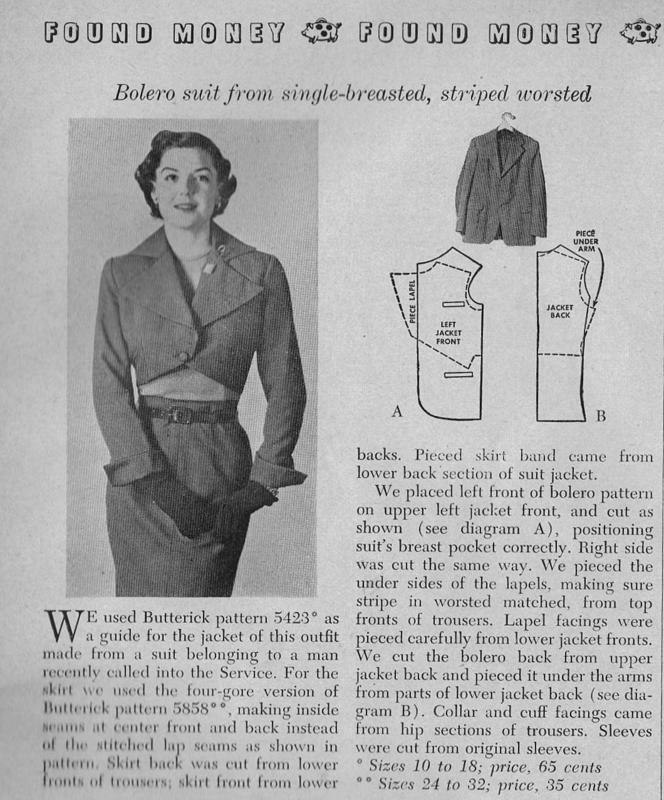 Oh how fun is that a Woman's Day from 1951?!! This is a great article. Love the up-cycled suits and you're right they looked smaller than a 12...however, I am going tell my self that's how fabulous a 12 and up looks!! I agree, no one looks like a size 12 to me!! I do love these creative ideas. I guess re-purposing goes back a long way. Remember Scarlet in Gone With The Wind? Man, they put a lot of work into their transformations. Love the results though. 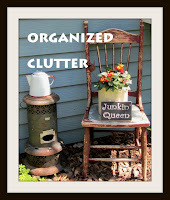 Fun post, Carlene! A size 12 was at about an 8....back in the day. 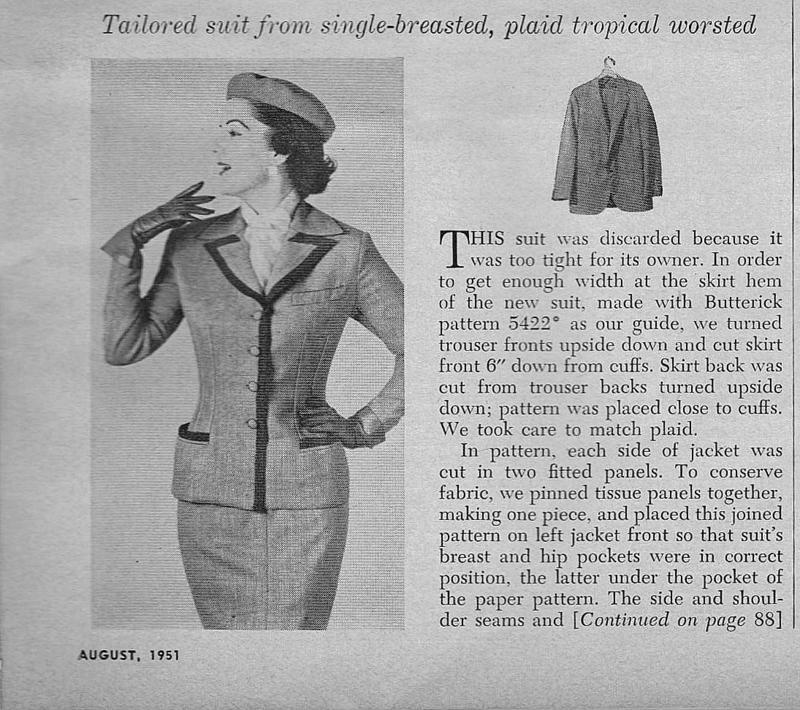 Patterns and women's clothing is not the same as it is today. 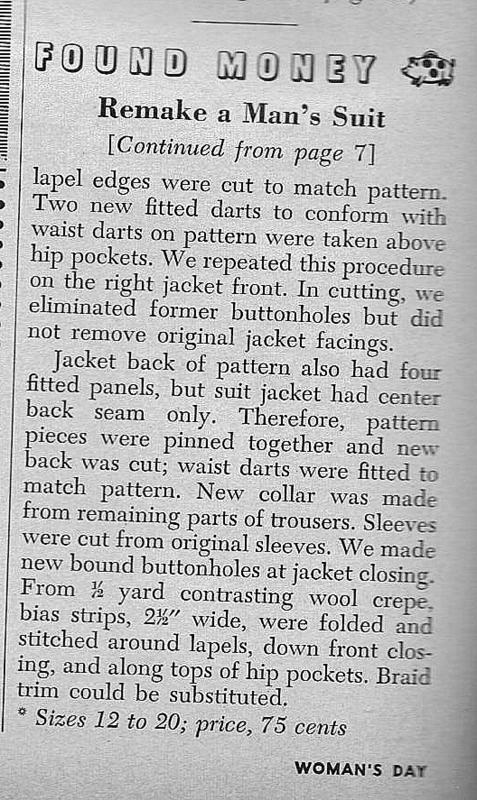 I loved these creative patterns...how fun, my mom was a seamstress and made my dad's suits, I can see her doing one of these! What fun to see this! 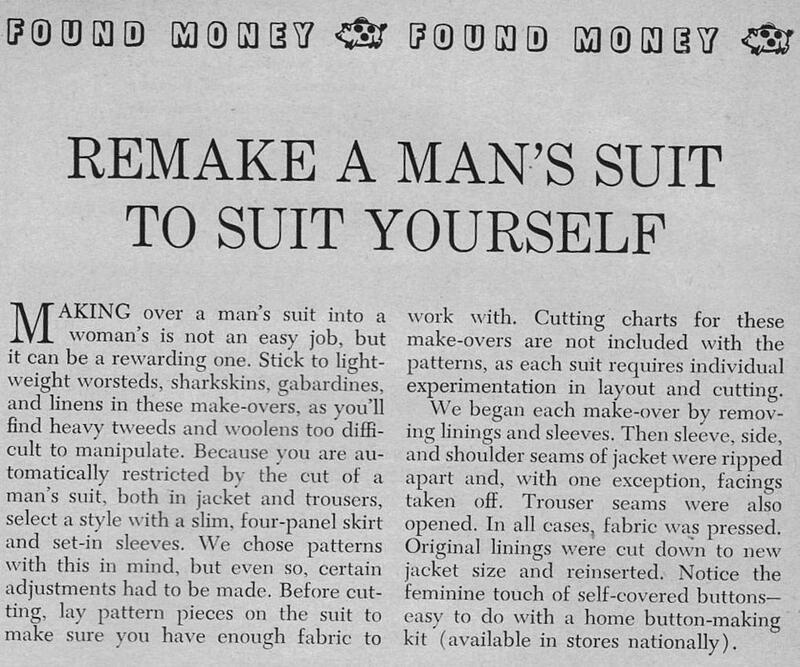 LOVE the look of the madeover man's suit! I'd wear them...they are gorgeous. One of the big fashion magazines had an article about how sizes have changed over the years, and I think a size twelve back then is like a size six today. Love the photos of the remade men's suits!